Sleep-disordered breathing (SDB) is characterized by repetitive upper airway obstruction and consequent oxyhemoglobin desaturation during the deeper stages of sleep. The proposed etiology is a combination of both abnormal upper airway anatomy and a yet-to-be determined aberrant afferent/efferent somatosensory loop. The health-related consequences of SDB are well documented by large prospective cohort studies and chiefly include hypertension, myocardial infarction, stroke, diabetes, depression, excessive daytime fatigue, and a greater risk of motor vehicle accidents. These associated medical problems place an enormous financial burden on society. Because of the high prevalence of this condition, cost-effective management is essential. Fortunately, a number of viable management options are available. The most common initial treatment for SDB is a continuous positive airway pressure (CPAP) device. [2, 3] However, CPAP devices can prove annoying and discomforting to many patients, and, for some patients, may be entirely intolerable. Thus, CPAP is effective only for patients who can tolerate the device and, unfortunately, affords no permanent cure. See also Sleep-Disordered Breathing and CPAP and Surgical Approach to Snoring and Sleep Apnea. Snoring, a common symptom of SDB, is a repetitive sound caused by vibration of upper airway structures during sleep. Snoring is a good indicator of increased upper airway resistance. Patients who have obstructive sleep apnea (OSA) generally have smaller upper airways than normal individuals. Increased parapharyngeal fat, a large tongue, an elongated palate, thickened lateral pharyngeal walls, as well as maxillofacial skeletal deficiencies may all play a role in OSA. Lateral pharyngeal wall encroachment by the peritonsillar pillars and tonsillar tissue is also an important etiology of OSA. This tissue bulk may direct the airway anteroposteriorly, as opposed to the normal lateral orientation, forcing the pharyngeal muscles to act at a disadvantage. Greater pharyngeal length increases collapsibility, which may explain why men are more susceptible to OSA than women. See also Upper Airway Evaluation in Snoring and Obstructive Sleep Apnea and Physiologic Approach in Snoring and Obstructive Sleep Apnea. The symptom and physical findings in patients with SDB, as well as tests used to diagnose this disorder, are briefly discussed below. Affected patients typically exhibit increases in body mass index (BMI) (about 75% of patients), blood pressure, and neck circumference and waist-hip ratio. The upper airway should be examined to evaluate for a low hanging, bulky soft palate; large tonsils; large tongue; dental malocclusion; low hyoid position; or maxillomandibular deficiency. The Epworth Sleepiness Scale (ESS) is a questionnaire used to screen for sleep apnea that relies on the patient's description of symptoms. Polysomnography (testing in a sleep laboratory) is the gold standard test used to establish the diagnosis of SDB. The multiple sleep latency test (MSLT) is used to establish how rapidly the patient falls asleep, to distinguish from narcolepsy. Lateral cephalometric radiographs reveal the dimensions of the airway column, the position of the hyoid bone, and the craniofacial skeleton for any maxillomandibular deficiencies. Flexible fiberoptic nasopharyngoscopy examines in real-time the three-dimensional (3-D) structure of the airway revealing any anatomic sites of obstruction. See also Obstructive Sleep Apnea, Childhood Sleep Apnea, and Obstructive Sleep Apnea and Home Sleep Monitoring. The patient’s position during sleep can affect simple snoring in patients with significant SDB. In patients whose snoring is primarily due to nasal airway obstruction, surgical or prosthetic intervention may be of benefit. Positioning of the patient during sleep is a useful method to control simple snoring. In mild cases, snoring is often resolved when the patient assumes a nonsupine position, which may relieve the obstruction. The physiology is intuitively simple: the soft palate and tongue fall posteriorly due to gravity and relaxation of the genioglossus. When the mouth opens, the tongue is even more retrodisplaced. Airway obstruction may result in oxyhemoglobin desaturation if apnea occurs. The effect of positioning is demonstrated by polysomnography, which often shows more frequent and severe disordered breathing events when the patient is supine. The classic remedy of attaching a tennis ball to the back of the individual's pajamas may help some patients with mild cases. However, most patients with significant SDB show apnea in all positions. Thus, this technique is seldom useful for patients with more than simple snoring. A snoring pillow may help some patients with snoring problems. Used appropriately, the pillow positions the head so that the mouth is closed and the jaw is held forward. Unfortunately, movement during sleep minimizes the pillow's effectiveness. In the normal airway, the limen nasi is the site of the highest resistance to airflow. Collapsed alae, a severely deviated septum, or hypertrophied turbinates may affect airflow substantially. Nasal valve surgery has been demonstrated to improve snoring for many patients whose primary problem is nasal airway obstruction. Although surgical therapy is effective for treating nasal valve obstruction, devices that splay the alae (externally or internally) have also demonstrated success in improving nasal airflow and decreasing snoring. [12, 13] However, studies disagree on whether significant improvement occurs. Although anecdotal reports describe patients whose sleep apnea may have been controlled by alar splaying devices, no statistical difference in patients using the devices compared with controls has been demonstrated. These devices are benign, inexpensive, and available at any pharmacy. For patients with minimal problems and noticeable nasal airway obstruction, devices that splay the alae are easy to obtain for an at-home trial. Nasal trumpets may be useful for short-term management in select patients. Trumpets are commonly used in postanesthesia airway management. These devices bypass any nasal, soft-palate, and, often, tongue-base obstructions. However, few patients are willing to use the trumpets nightly to control SDB. There are numerous patented oral appliances that treat sleep-disordered breathing (SDB) problems, such as snoring and obstructive sleep apnea (OSA). These devices and appliances address a range of processes that result in SDB. This article discusses the general principles involved in controlling SDB and the most effective prosthetic devices for alleviating the condition. 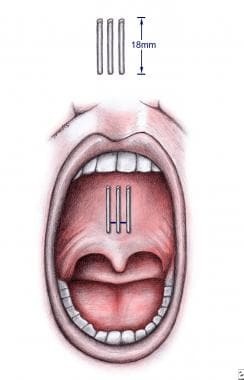 Illustration of the intraoral placement of 3 pillar implants in the soft palate. Patients with significant sleep-disordered breathing (SDB) almost always have some component of soft-palate or tongue-base obstruction (typically both). To date, more than 40 different oral appliances have been patented to treat snoring and obstructive sleep apnea (OSA). These devices can be divided into two basic categories, fixed devices and adjustable devices. Each group can be subdivided into noncustom devices (ie, mass produced/one-size-fits-all) and custom devices (ie, fabricated from specific patient impressions). Although most appliances appear similar superficially, because they share the same physiologic principles, they are actually quite different due to basic design features. See also Obstructive Sleep Apnea; Childhood Sleep Apnea; Surgical Approach to Snoring and Sleep Apnea; Obstructive Sleep Apnea and Home Sleep Monitoring; Upper Airway Evaluation in Snoring and Obstructive Sleep Apnea; Sleep-Disordered Breathing and CPAP; and Physiologic Approach in Snoring and Obstructive Sleep Apnea. Compared with other treatment modalities, oral appliance therapy has several advantages, including simplicity, reversibility, cost-effectiveness, and broad applicability for varying degrees of SDB. An oral appliance can be used to treat simple snoring, upper airway resistance syndrome (UARS), and OSA. In addition, this type of therapy can also be used in conjunction with other forms of treatment. Three primary features determine whether therapy with oral appliances will be successful in patients with SDB: retention, adjustability, and adaptability. Other factors that influence a positive outcome with these devices include younger patient age, lower BMI, smaller neck size, positional OSA-hypopnea syndrome (OSAHS), and a lower apnea-hypopnea index (AHI). Oral appliances must fit accurately, comfortably, and remain in position all night. Some devices are made of hard acrylics that wedge against the height of contour of each tooth. Rigid oral appliances periodically require realigning, which is a labor-intensive process. If the patient neglects realigning and continues to wear the device, movement and misalignment of teeth can occur. Some appliances use orthodontic retentive mechanisms (ie, ball clasps, Adams clasps) that use undercuts on a select number of teeth. Because only a few areas, usually interproximal, are involved (typically four in each arch), movement of teeth frequently occurs. Heat-sensitive elastomeric materials have also been used. These materials have proven to be the most effective in retention of oral appliances. They allow contact with more dental surface area, including undercuts and portions of interproximal areas, resulting in a more uniform fit and higher rates of appliance retention. Most noncustom oral appliances are made of soft boil-and-bite elastometrics that usually fail to maintain adequate retention for long when expected to attach to both maxillary and mandibular dentition. Although Pillar palatal implants are a relatively newer modality, short-term studies have shown good retention. One long term study demonstrated a 17.8% partial extrusion rate. Oral appliances should be able to variably adjust mandibular position. Many methods are available, such as interchangeable shims, incremental slots, and rotational mechanisms. Both shim and slot methods can be limiting due to the distance required of the mandible (seldom < 1 mm and often 2 mm), which may initiate muscular and/or joint sensitivity. Increments this large may jeopardize the clinicians' ability to optimize treatment. Increased efficacy can be achieved with a rotational mechanism that allows for more precise positioning of the mandible. Pillar palatal implants are not adjustable, and once inserted remain in place. Oral appliances must be adaptable to dentition changes (ie, fillings, crowns). Pillar palatal implants are placed into the soft palate, near the junction of the hard palate (see the following image). Consequently, they are adaptable to all patients without palate clefts or fistulas. 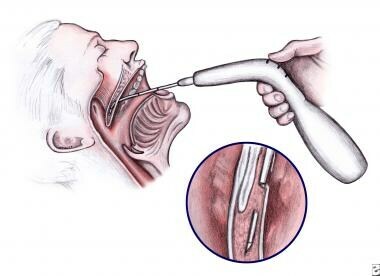 Illustration of the technique of placing Pillar implants into the soft palate. As a patient’s weight increases, SDB symptoms usually intensify. With weight loss, SDB symptoms typically diminish. With age, muscles in the pharyngeal area atrophy, thus increasing obstruction. Congestion and sinus drainage contribute to nasal and pharyngeal inflammation, constricting the airway and aggravating SDB. Central nervous system (CNS) depressants and muscle relaxants may have a counterproductive sedative or relaxant effect. Proper sleep hygiene is desirable, with 8 hours total sleep time considered optimal. Maintenance of a consistent sleep schedule also mitigates problems. Obstruction is more prevalent in a supine position. Environmental factors (eg, temperature, lighting, noise, comfort) affect quality and length of sleep. Oral appliances can advance the soft palate, tongue, or mandible, thus opening the airway. However, devices that advance the soft palate are seldom employed, most likely because of stimulation of the gag reflex and discomfort. Devices that advance the tongue alone are also rarely used, probably for similar reasons and because of the success of adjustable oral appliances. During obstructive apneas, the collapsed pharynx prevents airflow, which leads to continued negative pressure generated by respiratory efforts. The cycle continues, until the patient is aroused. Traditional devices work by downwardly rotating, and in some cases advancing, the mandible. By altering the position of upper airway structures, these devices serve to enlarge the airway and/or reduce collapsibility. Oral appliances that fixate and/or alter the relative position of the mandible to the maxilla affect the pharyngeal soft tissues by increasing the airway space, stabilizing the mandible in an anterior and closed position, advancing the tongue, and increasing genioglossus muscle activity. Variations in design include restricted elastic bands, clasps, or tubes for opening the mouth. These modifications act to relieve pressure and produce posterior extension of the maxillary component so as to modify the position of the soft palate or tongue. Dental impressions are generally required for mandibular advancing devices and anterior tongue retainers. However, prefabricated models can now be purchased. Proper fitting and alignment as well as regular patient follow-up are important components of therapy. A newer treatment option is the Pillar palatal implant, which was originally developed for the treatment of snoring. However, studies have demonstrated it has some efficacy in treating mild to moderate sleep apnea. [21, 22, 23, 24, 25] This system involves the placement of three mesh, polyethylene terephthalate implants, 18 mm × 2 mm each, within the soft palate muscles under local anesthesia (see the images below). These permanent implants improve snoring by stiffening the palate and decreasing its vibratory movement during inspiration. Millions of Americans are affected by sleep-disordered breathing (SDB). Various treatments are available, depending on disease severity, patient anatomy, and natural inclination regarding treatment options. Some patients are claustrophobic and cannot use continuous positive airway pressure (CPAP) but can tolerate oral appliances. Others may fear surgery or simply want surgery as the last option. Oral appliances are simple, effective, and inexpensive and should be considered as potential treatment by any otolaryngologist who treats patients with snoring or sleep apnea. Treatment with oral appliances begins with an initial consultation and examination. Close collaboration with a dentist is recommended when oral appliance therapy is being considered. The patient’s available dental records should be acquired. Although tongue position and tonsil size can influence the success of the Pillar implants (see Design Features), no other contraindications have been identified to date. Studies related to the use of prosthetic devices, such as oral appliances and Pillar palatal implants, are briefly discussed. A study by Pancer et al of the Thornton anterior positioner (TAP) demonstrated effectiveness of the adjustable device in patients with mild to moderate sleep-disordered breathing (SDB). Of 75 patients evaluated by polysomnography, with and without the appliance, 38 patients achieved resolution of their OSA with the device alone. In an additional 31 patients, the AHI was reduced from 54 ± 31 to 20 ± 12. Univariate regression analysis demonstrated an inverse correlation between the percentage improvement of AHI and both baseline AHI and body mass index (BMI). No correlation with age was noted. Although not a clinical trial, a cohort study of 35 patients evaluated the efficacy of the Dynamax oral appliance in mild to moderate OSA. An overall compliance rate of 60% was reported, with bed partners describing "improved snoring" in 70% of the participants. Ten patients had tried continuous positive airway pressure (CPAP) before the prosthesis; 80% of these patients cited easier tolerance of the oral appliance. Epworth scores were improved, as were overnight oximetry measurements. Polysomnography was not used to evaluate changes in OSA parameters such as AHI. One study assessed the efficacy of Pillar palatal implants in patients with socially significant snoring, without a history of OSA and found improvements in snoring, as rated by bed partners, following the procedure. The outcome was assessed by the change in snoring severity measured by the bed partner using a 10-cm visual analogue scale, with 10 representing snoring that was unbearable. Snoring, rated by the bed partner, had a baseline mean value of 8.5, which decreased to 5 at 30 days and to 4.4 at 90 days posttreatment. All patients tolerated the procedure well. At 90 days, 75% of patients and 90% of their bed partners advocated the procedure. Another clinical trial that evaluated the efficacy of Pillar palatal implants in mild to moderate OSA demonstrated that 80% of patients achieved reductions in AHI values. Nearly 60% of these patients achieved resolution of apnea. Two randomized control trials compared Pillar palatal implants to sham procedures and placebo in treating mild to moderate sleep apnea and demonstrated a statistically significant change in AHI, quality-of-life–questionnaire scores and subjective snoring scores. [22, 23] However, the clinical significance of Pillar palatal implants efficacy alone in treating mild to moderate OSA remains questionable, as very few patients in these trials had a reduction of their sleep parameters to the often accepted definition of surgical "cure" (AHI decrease by ≥ 50% to presurgery as well as AHI < 20). Further studies regarding the efficacy of Pillar palatal implants in OSA are required. Thoroughly instruct the patient in the use and care of the oral appliance, and follow up in 2-4 weeks. An objective analysis of progress includes pulse oximetry findings and polysomnography. It is recommended to follow up with the patient at 6-month intervals for as long as the prosthetic is used to check the status of the patient, the patient’s dentition, and the device itself. Expected sequelae or problems and possible adverse effects with the use of oral appliances are briefly discussed below. Some patients may be unable to tolerate oral appliances. Many develop temporary adverse sensitivities of teeth, mastication muscles, and temporomandibular joint dysfunction (TMJD). Consider these problems a normal part of insertion, adjustment, and removal transition phases that should improve with time. Temporary bite changes after removal of the device last 5-60 minutes. Such changes should always resolve in a reasonable time with no discomfort. Some patients experience increased salivary production. Individuals who breathe through their mouths often experience dry mouth. Pillar palatal implants may extrude over time, although the frequency of this occurrence is low (< 1% according to the manufacturer). The inflammatory reaction that ensues after insertion usually binds the three implants together and stabilizes their positions permanently. Adverse effects specific to soft-palate implants include difficulty speaking or swallowing and ear or jaw pain, all secondary to initial postprocedural swelling. A foreign-body sensation may also occur over time. These implants may also be extruded, thereby requiring replacement. Stierer T, Punjabi NM. Demographics and diagnosis of obstructive sleep apnea. Anesthesiol Clin North America. 2005 Sep. 23(3):405-20, v. [Medline]. Kushida CA, Morgenthaler TI, Littner MR, Alessi CA, Bailey D, Coleman J Jr, et al. Practice parameters for the treatment of snoring and obstructive sleep apnea with oral appliances: an update for 2005. Sleep. 2006 Feb 1. 29(2):240-3. [Medline]. Victor LD. Treatment of obstructive sleep apnea in primary care. Am Fam Physician. 2004 Feb 1. 69(3):561-8. [Medline]. Fairbanks DN. Snoring: surgical vs. nonsurgical management. Laryngoscope. 1984 Sep. 94(9):1188-92. [Medline]. [Guideline] Ramar K, Dort LC, Katz SG, et al. Clinical Practice Guideline for the Treatment of Obstructive Sleep Apnea and Snoring with Oral Appliance Therapy: An Update for 2015. J Clin Sleep Med. 2015 Jul 15. 11 (7):773-827. [Medline]. [Full Text]. Conley RS. Management of sleep apnea: a critical look at intra-oral appliances. Orthod Craniofac Res. 2015 Apr. 18 Suppl 1:83-90. [Medline]. [Full Text]. Hensley M. Sleep apnoea. In: Hensley M, Ray C, eds. Clinical Evidence. 13th ed. London, UK: BMJ Publishing Group; 2005. 2184-96. Pashayan AG, Passannante AN, Rock P. Pathophysiology of obstructive sleep apnea. Anesthesiol Clin North America. 2005 Sep. 23(3):431-43, vi. [Medline]. Sher AE. Obstructive sleep apnea syndrome: a complex disorder of the upper airway. Otolaryngol Clin North Am. 1990 Aug. 23(4):593-608. [Medline]. Jensen R, Olsborg C, Salvesen R, Torbergsen T, Bekkelund SI. Is obstructive sleep apnea syndrome associated with headache?. Acta Neurol Scand. 2004 Mar. 109(3):180-4. [Medline]. Olson EJ, Park JG, Morgenthaler TI. Obstructive sleep apnea-hypopnea syndrome. Prim Care. 2005 Jun. 32(2):329-59. [Medline]. Liistro G, Rombaux P, Dury M, Pieters T, Aubert G, Rodenstein DO. Effects of Breathe Right on snoring: a polysomnographic study. Respir Med. 1998 Aug. 92(8):1076-8. [Medline]. Ulfberg J, Fenton G. Effect of Breathe Right nasal strip on snoring. Rhinology. 1997 Jun. 35(2):50-2. [Medline]. Lowe AA, Sjöholm TT, Ryan CF, Fleetham JA, Ferguson KA, Remmers JE. Treatment, airway and compliance effects of a titratable oral appliance. Sleep. 2000 Jun 15. 23 Suppl 4:S172-8. [Medline]. Dort LC, Hussein J. Snoring and obstructive sleep apnea: compliance with oral appliance therapy. J Otolaryngol. 2004 Jun. 33(3):172-6. [Medline]. Ferguson KA, Ono T, Lowe AA, Keenan SP, Fleetham JA. A randomized crossover study of an oral appliance vs nasal-continuous positive airway pressure in the treatment of mild-moderate obstructive sleep apnea. Chest. 1996 May. 109(5):1269-75. [Medline]. Lim J, Lasserson TJ, Fleetham J, Wright J. Oral appliances for obstructive sleep apnoea. Cochrane Database Syst Rev. 2006 Jan 25. CD004435. [Medline]. Schmidt-Nowara W, Lowe A, Wiegand L, Cartwright R, Perez-Guerra F, Menn S. Oral appliances for the treatment of snoring and obstructive sleep apnea: a review. Sleep. 1995 Jul. 18(6):501-10. [Medline]. Ferguson KA, Cartwright R, Rogers R, Schmidt-Nowara W. Oral appliances for snoring and obstructive sleep apnea: a review. Sleep. 2006 Feb 1. 29(2):244-62. [Medline]. AlRumaih HS, Baba NZ, AlShehri A, AlHelal A, Al-Humaidan A. Obstructive Sleep Apnea Management: An Overview of the Literature. J Prosthodont. 2016 Sep 6. [Medline]. Nordgård S, Stene BK, Skjøstad KW. Soft palate implants for the treatment of mild to moderate obstructive sleep apnea. Otolaryngol Head Neck Surg. 2006 Apr. 134(4):565-70. [Medline]. Friedman M, Schalch P, Lin HC, Kakodkar KA, Joseph NJ, Mazloom N. Palatal implants for the treatment of snoring and obstructive sleep apnea/hypopnea syndrome. Otolaryngol Head Neck Surg. 2008 Feb. 138(2):209-16. [Medline]. Steward DL, Huntley TC, Woodson BT, Surdulescu V. Palate implants for obstructive sleep apnea: multi-institution, randomized, placebo-controlled study. Otolaryngol Head Neck Surg. 2008 Oct. 139(4):506-10. [Medline]. Nordgård S, Stene BK, Skjøstad KW, Bugten V, Wormdal K, Hansen NV, et al. Palatal implants for the treatment of snoring: long-term results. Otolaryngol Head Neck Surg. 2006 Apr. 134(4):558-64. [Medline]. Romanow JH, Catalano PJ. Initial U.S. pilot study: palatal implants for the treatment of snoring. Otolaryngol Head Neck Surg. 2006 Apr. 134(4):551-7. [Medline]. Singh GD, Callister JD. Effect of a maxillary appliance in an adult with obstructive sleep apnea: a case report. Cranio. 2013 Jul. 31(3):171-5. [Medline]. Giannasi LC, Almeida FR, Nacif SR, de Oliveira LV. Efficacy of an oral appliance for the treatment of obstructive sleep apnea. Int J Prosthodont. 2013 Jul-Aug. 26(4):334-9. [Medline]. Zhou J, Liu YH. A randomised titrated crossover study comparing two oral appliances in the treatment for mild to moderate obstructive sleep apnoea/hypopnoea syndrome. J Oral Rehabil. 2012 Dec. 39(12):914-22. [Medline]. Zhu Y, Long H, Jian F, et al. The effectiveness of oral appliances for obstructive sleep apnea syndrome: A meta-analysis. J Dent. 2015 Dec. 43 (12):1394-402. [Medline]. Pancer J, Al-Faifi S, Al-Faifi M, Hoffstein V. Evaluation of variable mandibular advancement appliance for treatment of snoring and sleep apnea. Chest. 1999 Dec. 116(6):1511-8. [Medline]. Thickett EM, Hirani S, Williams A, Hodgkins J. A prospective evaluation assessing the effectiveness of the 'Dynamax' mandibular appliance in the management of obstructive sleep apnoea. Surgeon. 2009 Feb. 7(1):14-7. [Medline]. White DP, Shafazand S. Mandibular Advancement Device vs CPAP in the Treatment of Obstructive Sleep Apnea: Are they Equally Effective in Short Term Health Outcomes?. J Clin Sleep Med. 2013 Sep. 9(9):971-2. [Medline]. [Full Text]. Zhang M, Liu Y, Liu Y, et al. Effectiveness of oral appliances versus continuous positive airway pressure in treatment of OSA patients: an updated meta-analysis. Cranio. 2018 May 24. 1-18. [Medline]. Serra-Torres S, Bellot-Arcis C, Montiel-Company JM, Marco-Algarra J, Almerich-Silla JM. Effectiveness of mandibular advancement appliances in treating obstructive sleep apnea syndrome: A systematic review. Laryngoscope. 2016 Feb. 126 (2):507-14. [Medline]. Pantin CC, Hillman DR, Tennant M. Dental side effects of an oral device to treat snoring and obstructive sleep apnea. Sleep. 1999 Mar 15. 22(2):237-40. [Medline]. Almeida FR, Lowe AA, Sung JO, Tsuiki S, Otsuka R. Long-term sequellae of oral appliance therapy in obstructive sleep apnea patients: Part 1. Cephalometric analysis. Am J Orthod Dentofacial Orthop. 2006 Feb. 129(2):195-204. [Medline]. The authors and editors of eMedicine gratefully acknowledge the contributions of previous author D Heath Roberts, DDS, to the development and writing of the source article.